This durable interactive ball starts blinking when you bounce it; turning your typical game of fetch into an exciting multi-sensory experience. 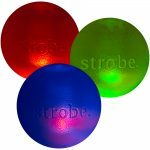 Once the ball is thrown and hits a firm surface a multi-colored LED light automatically starts blinking. The LED light is embedded with the same impenetrable technology as the company’s award-winning Squeak Ball. The light is tightly and safely enclosed in a non-toxic sleeve that is then embedded into the ball during the molding process. This patent-pending technology requires no glues or adhesives making it 100% non-toxic. The Strobe’s light has a life of 200 hours, that’s over 36,000 throws. The Glow Strobe ball glows in the dark for night time play. Strobe is made with Planet Dog’s Orbee-Tuff® Made in the USA, durable, completely non-toxic, buoyant material and is as safe for humans (even babies) as it is for dogs.